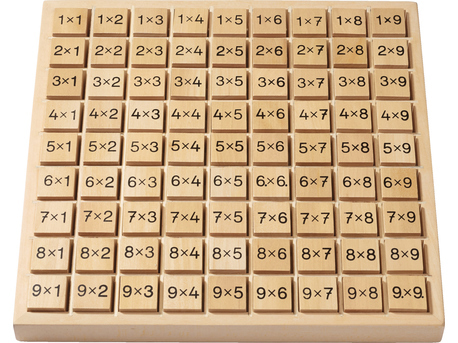 Touch-and-feel multiplication: when the dice are held in the hand, multiplication will be associated with activity – and sequences will be remembered more easily. On one side of the wooden dice there is a sum, and on the other side the solution. 81 wooden dice in wooden frame (27.5 x 27.5 cm). Tip: Younger players can sort the dice according to sequences (e.g. 1 x 3, 6, 3 x 3, 12) or put mixed-up dice in the correct order.